It’s been 15 years since Xdebug first came out. We think this is the perfect opportunity to re-introduce it to the world, and explain how and why it does what it does. stack traces – detailed output of the path the application took to reach a given error, including parameters passed to functions, in order to easily track the error down. a profiler for finding out where the bottlenecks in your code are, and the ability to visualize those performance graphs in external tools. What this results in is a graph similar to that which Blackfire produces. 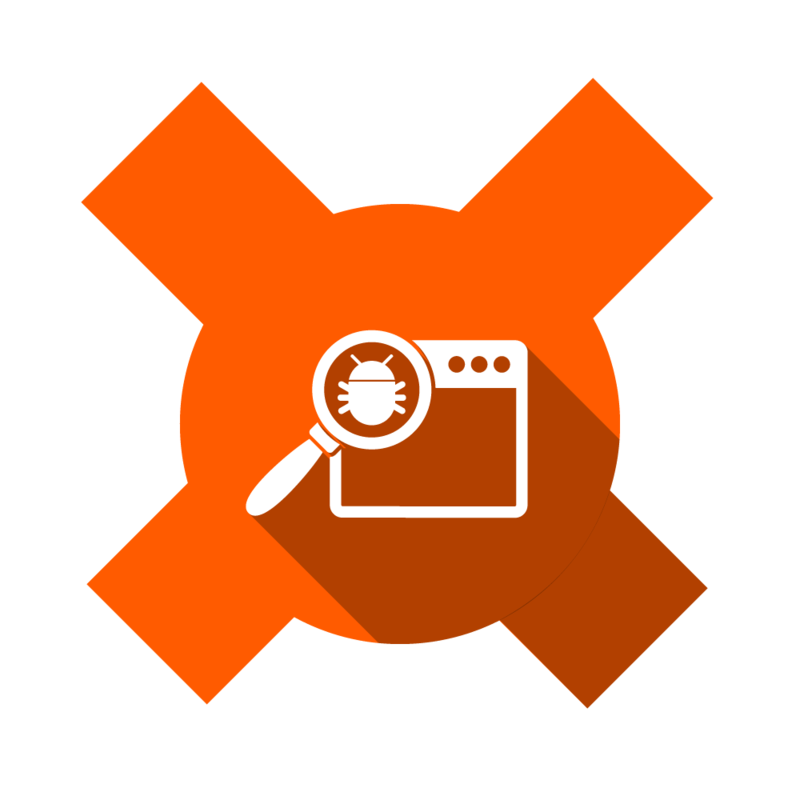 a remote debugger which can be used to remotely connect Xdebug with running code and an end-client like an IDE or a browser to step through breakpoints in code and execute line by line of your application. code coverage which tells you how much of your code was executed during a request. This is almost exclusively meant to help with unit tests and finding out how much of your code is test-covered. Xdebug comes with a detailed installation page which handles most if not all use cases, but if you’d like to play with the functionality presented below, we recommend using Homestead Improved which comes with the extension pre-installed and activated. With modern IDEs and Blackfire, is there even a need for Xdebug? IDEs do provide good code lookup functionality, so the link format functionality’s usefulness can seem questionable. There’s also loggers of all kinds now which can handle errors and exceptions. Likewise, function traces and profiling are done really well in Blackfire. However, file link formats are just one part of Xdebug, and using Blackfire has its own hurdles – installing the extension, setting up the keys, and then paying to keep trace history. Loggers also need to be used with a lot of foresight, and aren’t very easy to add into an application later on. There’s more to Xdebug than just this, though – it’s still required for proper unit testing (testing frameworks depend on it for code coverage reports), it’s far from easy to get remote break-point debugging going via other means, and it’s a tool so old and stable it’s been ironed out to near perfection. If your current tools can handle everything it offers or you don’t need the features it offers then of course, there’s no need for Xdebug, but I’ve yet to start a single project that could be completed just as efficiently without it. I’ll assume you have a working Xdebug installation at this point. If not, please consider using Homestead Improved. Note: if you’re using another development environment with a different PHP installation, your Xdebug ini file might be elsewhere. Consult your system’s documentation for the exact location, or ask in the comments below. Looks quite barren, doesn’t it? It’s missing the whole call stack. Granted, this information isn’t particularly useful at this point since we’re only dealing with a single line in a single file, but we’ll look at a heavier use later on. Reactivate Xdebug now by removing the comment in the previously edited file, and let’s continue. Don’t forget to restart PHP! If you’re a developer who’s fixed on an IDE (like I am on PhpStorm), it would definitely be useful to be able to click on files in the stack trace and go directly to them in the IDE. A non-trivial upgrade in debugging speed, for sure. I’ll demonstrate the implementation of this feature for PhpStorm. Note that this will work in some browsers, and won’t in others. For example, Opera has problems with phpstorm:// links and will gladly crash, while Firefox and Chrome work just fine. The process is the same for other IDEs and editors. Why stop at this, though? Many people today develop on virtual machines, making sure no part of the PHP runtime ever touches their main machine, keeping everything fast and smooth. How does Xdebug behave in those cases? Additionally, is it even possible to do break-point debugging where you step through your code and inspect each line separately when using such complex environments? Luckily, Xdebug supports break-point-powered remote connections perfectly. We’ve covered the process before, so for a full gif-powered setup tutorial, please follow this guide. 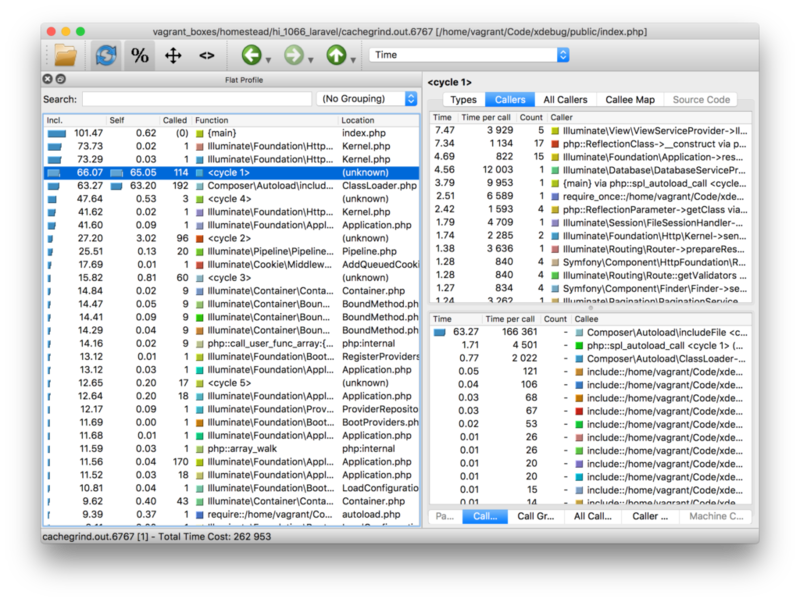 As a final quick tip, let’s inspect one of the often neglected features: the profiler. For that, we’ll need a heavy application like Laravel. Note that we’re not using xdebug.profiler_enable = 1 because we don’t want it to stay on 100% of the time. Instead, we’ll use the trigger query param “XDEBUG_PROFILE” to selectively activate it. We’re also outputting the cachegrind profile into the main shared folder of our VM so that we can inspect it with tools on the host operating system. The profiler offers and immeasurable wealth of data and truly deep insight into the way your code behaves, just like Blackfire. With the profiler’s local output, however, it’s easier than ever to automate the continuous tracking of performance and execution complexity. 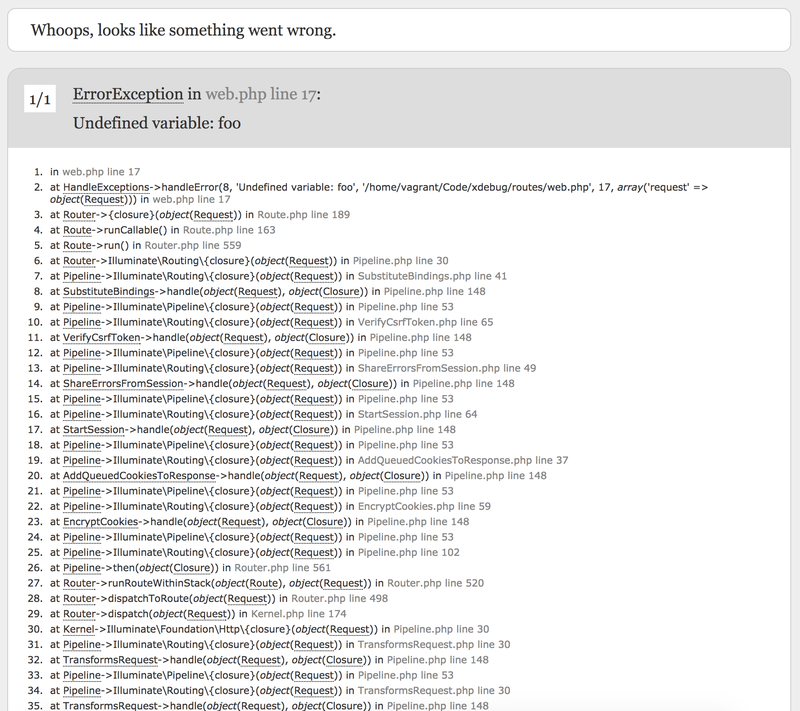 While Symfony’s error screen (which is what Laravel is using here) is configured to also play nice with Xdebug’s clickthrough (try it, you can now click on these files and their lines, too! ), I really miss the memory output (Xdebug by default also outputs the memory usage at every point in time in the stacktrace). Let’s revert this to Xdebug’s screen while in development mode, so we can inspect that attribute. You can see here we updated our default route so that it first activates the displaying of errors (the screen we saw earlier is not a shown error per-se, but a caught exception the stack trace of which was manually extracted and rendered), and then we restore the error handler to its default value, overriding Laravel’s. 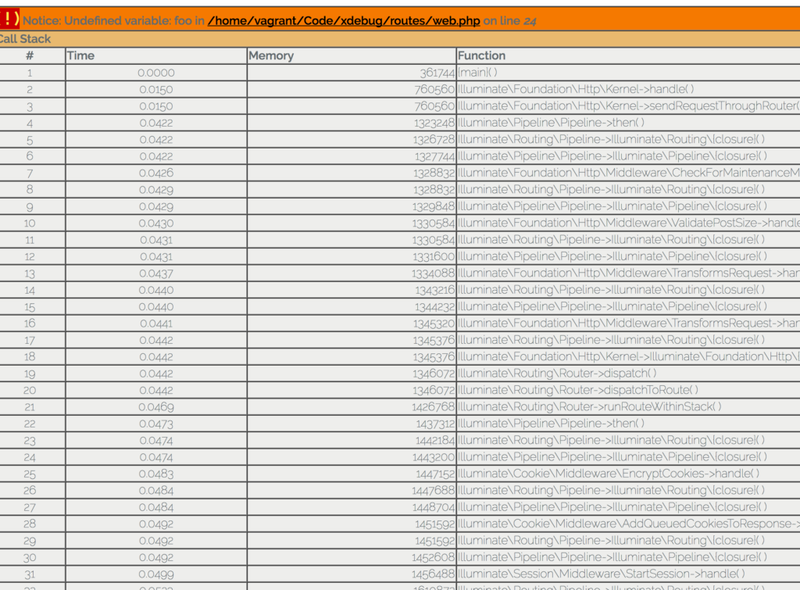 After refreshing, sure enough, our old screen is back – just look at that stack trace tower and memory consumption! I encourage you to investigate further on your own – look around in the docs, play with the options, see what you can find out about your applications. Xdebug is a valuable tool for any developer’s toolbelt. It’s a powerful extension that fully lives up to the word, extending the language we work in daily to be more verbose, more user friendly, and less mysterious when errors appear. With 15 whole years behind it, Xdebug has set a high standard for debugging tools. I’d like to thank Derick for developing and maintaining it all this time, and I’d love it if you chose to write a tutorial or two about in-depth usage, caveats, or secret feature combinations no one’s thought of before. Let’s spread the word and help it thrive for another 15 years.